My dive computer/watch beeps weakly at 2 am announcing the beginning of summit day. I wake my guide up and, sleepy and tired, he automatically lights the small gas stove and places on it a pot of ice to melt for our pre-departure tea. I have a Red Bull, put my puffy Primaloft pants on top of the fleece under layer, an enormous expedition parka, a thick balaclava over my head, and reach for the inner booties of my three-layer 8000-metre boots. Although I am an ice-swimmer, cold air gets to me all too easily: after all, it was the very real risk of getting frostbite which chased me down from Camp 4 on Manaslu. I hope to have learnt my lesson: in addition to thick gloves, I am carrying chemical hand-warmers and am generally over-dressed for a speed ascent of a 6800-metre peak. At 3:30 am my guide and I are ready to set off. Dorje is carrying everything we expect to need on summit day while all I have to drag up the hill is me; it seems like a lot. Standing outside the tent with my head-lamp shining on the cold rocks, I am waiting for Christophe. ‘Go on, don’t wait for me,’ says he. ‘I’ll see you on the summit,’ I suggest in reply, trying to sound warm and confident, and trod off. Almost immediately challenging climbing begins. Here in the dark is the famously vertiginous Grey Tower with its long pitches of mixed climbing leading vertically into the night sky. ‘Is there one or are there two of these Towers?’ I wonder as a thin ridge leads from the top of one icy rock face to the foot of another. ‘Let there be more,’ I say to myself, enjoying every move I make, suspended off a thin line over the hope of soaring and a possibility of crashing. I am smiling at the night, at the rocks and the flashlights of my friends dancing far, far below; like them I am waltzing in the air with my fears for partners, obscenely happy. The Mushroom Ridge leading into Camp 3 is stunning at dawn. My feet on the left and right sides of the abyss underneath, I stop and stare in awe at the sunrise, blushing over the Himalaya. ‘Sunrise…’ I muse, ‘I have no time to waste,’ and I climb on. It is very windy and cold at Camp 3 when my guide asks me about how my hands are feeling, making me focus on something I want to ignore – that I have had no feeling in my fingers for a while now. I smile at Dorje apologetically, admitting to being a little cold. He immediately gets me to put hand-warmers into my gloves and, still not satisfied, fishes out the backpack his own enormous expedition mitts that won’t even fit into my jumar. ‘That’s if you have hands, though,’ he reminds me. I let him put a mitt on my left hand which seems frozen. In the process of manipulating my glove, he lets it slip out of his grip for an instant – and it’s gone, headed for base camp. Then, he starts to massage my fingers angrily, and in a few minutes they are filled with stinging pain of the blood rushing back in. Now we can go on. We begin to move again, but the joy of climbing of the first three hours is gone while the summit looks not an inch nearer than when we started. The wind has been biting into my throat and lungs; my chest is cold from the inside; I cough uncontrollably. In front of me there are more ropes dripping down the blindingly white face of ice leading to the summit. The ice won’t accept even the tip of my axe – only the front points of my crampons seem to penetrate its unyielding surface a little. A little is enough, and we keep climbing. For hours. Other climbers, who started from Camp 3, catch up to us. Soon, the Austrian duo and their Sherpa pass us, too. I look up and feel tears well up under my glacier glasses, under my glassy stare of determination. ‘No more! I can’t do this anymore! No more! Please!’ the whinge inside me begs. I listen to this inner voice of pain like music which sets the rhythm and keeps me going. ‘Dorje, where’s the summit?’ I ask every other minute. ‘Dorje, what is that?’ I am looking at a colourful mass hanging off the fixed rope to my left. I pass the bottles without pausing and, following the rope, struggle up the last pitches towards the summit. 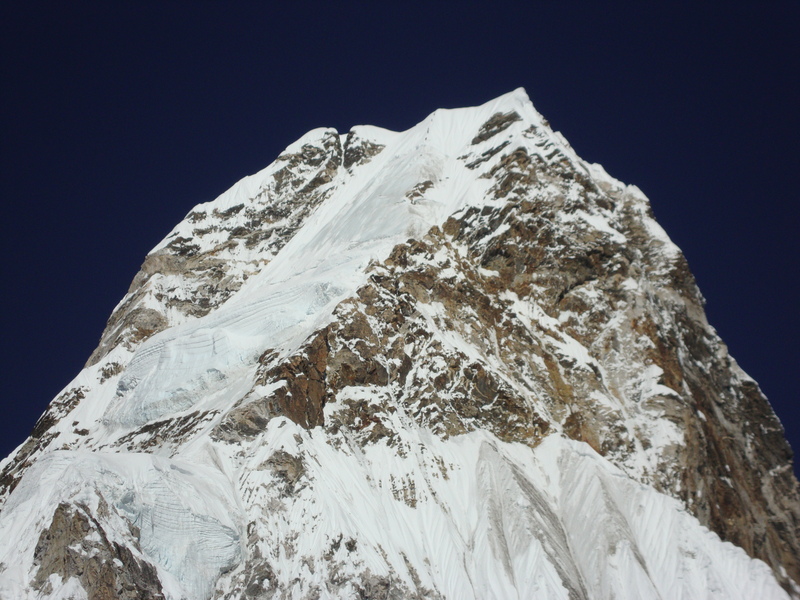 At noon I am finally on the spacious, even, windless, perfect summit plateau of Ama Dablam. 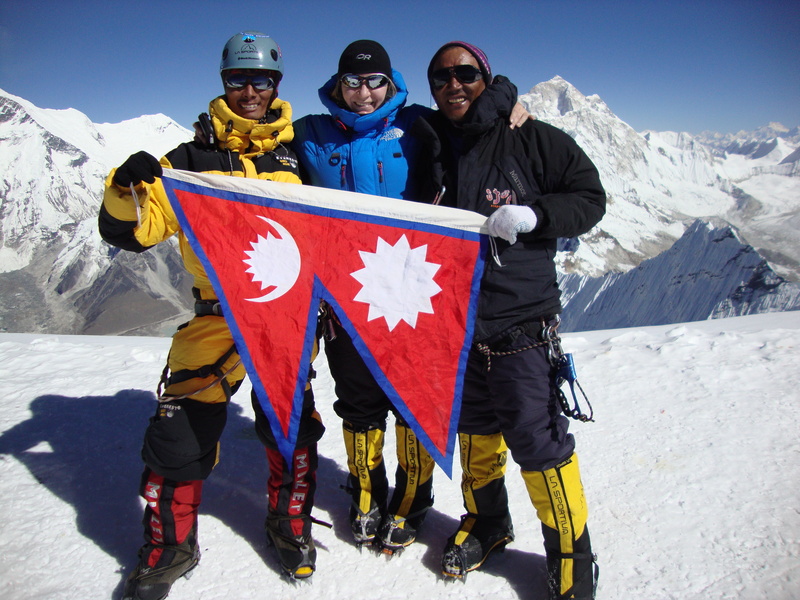 The Austrian duo, another climber and our Sherpas are on the summit with me. People take pictures, laugh, have snacks… I try to do the same and to look less drained than I really am; I force myself to feel the joy I expected to feel but there’s only a small spark of contentment which is growing cold, too. Getting back on my feet, I stare at Mt. Everest in the distance and at all the other peaks I would have smiled at familiarly if only I wasn’t blinded by fatigue. I sit back down again sensing that I will not make it down Ama Dablam: my neck and spirit broke under the weight of Mother’s Necklace. ‘Chop-chop!’ my guide says, but I barely hear him. ‘Do you want a Red Bull?’ he jokes, observing me, and pulls a can of my ‘magic potion’ out of the backpack. I can’t help laughing, and try to scrape myself off the summit plateau. ‘Chop-chop,’ I say as cheerfully as I can, clipping my safety karabiner back into the fixed line. Yet, resolve is not enough to get down: one actually has to move their arms and legs to achieve that – which is problematic if they have no strength left at all. None. At all. I turn away from the body and continue down. I do so because there is one person in the world who trusts me to keep walking wherever I am, whether exhausted, or injured, or dying. She trusts me not to put her through the torture of having to refer to me as a corpse on a mountain/in the ice/under the sea. My mother deserves a daughter who never gives up, and although I am not that daughter at all, I pretend to be. When my guide and I reach Camp 3, I half-expect him to reproach me for not letting him bring sleeping bags and food to spend the night in case of an emergency, which our situation is beginning to resemble. Time is passing and our downward progress in painfully slow. It’s 4 pm, which gives us just over two hours of daylight to get to Camp 2, and we both know that we won’t make before dark. ‘We sure do,’ I agree, ‘I even have spare batteries in the pack somewhere.’ We laugh together and step onto the Mushroom Ridge. I use my figure eight to rappel where possible, and Dorje helps me clip my safety karabiner into fixed rope; I am soon too tired even for that minor task and he performs it for me. Thus, we reach the Grey Tower. This means I have to down-climb with just my safety karabiner clipped into fixed rope for…psychological comfort. My arm muscles are numb and could not hold me on the rope if I slipped – all I can use them for is balance. My guide and I climb down quietly and carefully, and reach the bottom of the Tower by sunset. Camp 2 is close now: a couple more sharp ridges, and we stumble into the dark campsite. The Austrian guides are already asleep in their tent, and their Sherpa is melting ice for us. He tells me that Christophe had to abort his summit push and descend. I am genuinely sorry. I am also dead-tired. Inside the tent I sit on top my puffy sleeping bag holding a cup of tea; I am a broken doll. The two Sherpas talk outside in their tongue, then, Dorje bends and passes me his mobile. On the other end of the line is our mutual acquaintance and one of my dearest friends in Kathmandu. She tells me I am awesome, and so very strong to climb Ama Dablam so quickly, and that everyone misses me at ‘home’, and many other wonderful heart-warming things. I try to protest, but she wouldn’t listen. I want to tell her how badly I did on the descent and remind her – and myself – that I’m still on the mountain, still descending… I’m want her to know that I am not the unyielding woman people sometimes make me out to be – that I am truly very weak. Yet, she doesn’t hear me. Dorje crawls into his sleeping bag and bids me good-night. ‘You are very strong, Mila,’ says the man who has just spent his day saving me from my own recklessness. I choke on my shame and say good-night, too, still sitting up, holding that same cup of now cold tea; it feels heavy. Another brilliant write…I so love reading about your climbs…just amazing! Thank you kindly! Glad you’re enoying the story :)!